Guccivuitton is not the latest fashion house merger. Rather, it’s one of Miami’s newest and most shabby-chicest art galleries. It may also become it’s most subversive. Formed by three local artists, Guccivuitton recently closed its inaugural exhibition IRL (In Real Life), a show of work by Art404. The first night oscillated between haughty art opening and laid-back party - dogs and babies hung out as the crowd chatted and helped themselves to the duck pâté and homebrewed lager. Located on a stretch of Little Haiti, the gallery is run by Loriel Beltran, Domingo Castillo, and Aramis Gutierrez. They’re all young, well-known artists with established practices and have shown in Miami’s most prestigious institutions and galleries, but they decided to form their own space after a discussion about the possibilities and merits of developing a colloquial, Miamian aesthetic. Arguably taking on that aesthetic, Guccivuitton is entered through a caged storefront. The inside is in the shape of a long rectangle and it has white walls and bright lights like a good, typical gallery - but it also has an unrefined ground that’s unabashedly revealing of previous floorings. IRL hinted at the highly contemporary direction that the gallery’s programming might take. Art404, composed of Moses Sanabria and Manuel Palou, works mainly with internet and post-internet material (the latter meaning that they make physical work based on the memes and metaphysics of the world wide web), and they imbue it with a satirical, hyper-critical slant that bemoans corporate culture. At their most staid, the two artist/designers demean the world of advertising and branding in a typified manner – but at their best, they stage disruptive interventions and turn documentation of it into artwork. The show at Guccivuitton was illustrative of this dichotomy. A large projected video showed a trailer of sorts, viewable on Art404’s homepage. Manipulating the opening production credits in movies – think of the flying stars and mountains of Paramount Pictures and the triumphant drumming for 20th Century Fox– the trailer showed Art404 as the brand, as it mockingly listed their art and design services. 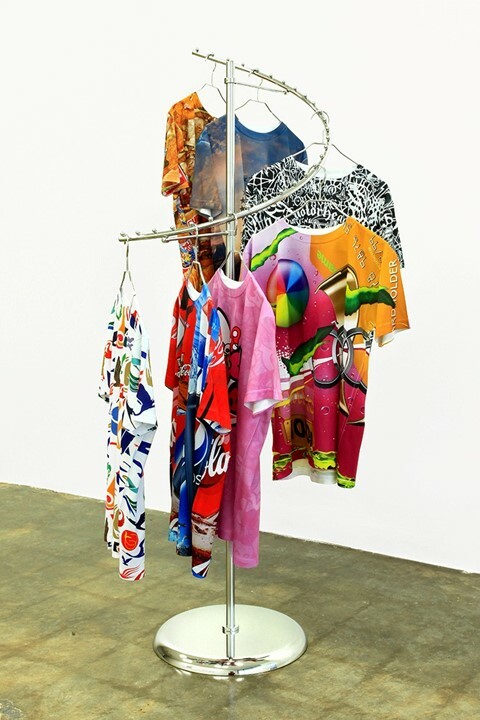 A rack with shirts from their “Maybe Legal” clothing line stood in the middle of the room, each containing vomitus, brightly colored and assorted corporate logos. Several attendees approached the gallerists about purchasing one of the shirts, but they were told that in fact the entire rack and shirts comprised a single sculpture. In the hall leading to the duck paste and brew, several square screens with black backgrounds and digitally green code paraded on a Macbook on a plinth. The code was part of a program performing a denial-of-service attack (where websites are temporarily knocked out) on some of the most prestigious cultural institutions and wealthiest gallerists. The denial-of-service, which requires thousands of computers running the same code, was a re-staging of a separate artwork that was also on view at Guccivuitton. In a work titled “Art vs. Anonymous,” Art404 gave a wish list of websites to be taken down to the hacktivist group Anonymous, after the shadowy, lefty political organization took down Art404’s website as a malicious show of affection for the duo’s work. They included the websites for the Tate, David Wirzner, and Gagosian Gallery, and prints of the screenshots showing their unavailable pages hung on the gallery’s walls. Though Art404 is not based in Miami, Domingo Castillo says that a primary motive for opening the gallery was to give local artists the chance to stage solo shows, a surprising rarity given the sustained cultural mushrooming that’s happening here. The plans for upcoming shows reflect this, and given time, this might be the most subversive thing that Guccivuitton will come to do.